Euro 2016 is now in full swing and, in their quest for glory, 24 European teams are battling it out in stadia across France to be crowned the champions of Europe. But away from their matches, the stars of the game will be kicking back in luxurious resorts the length and breadth of the country. From palatial residences, to heritage châteaux, these are the most unique hotels as chosen by the national teams of this year’s championships. Situated in the Chantilly commune of Picardy, the English national side kick off their Euro 2016 campaign at the most expensive hotel of any other team in the tournament. The uber-glamourous, two-Michelin-starred, £500-a-night Auberge du Jeu de Paume château sprawls across 20,000 acres – enough to fit 10,000 football pitches – and features a Spa Valmont, complete with indoor pool. Roy’s Boys can indulge in everything from a French garden designed by Le Nôtre, a romantically-themed jardin anglais — complete with fountain, an “island of love”, and temple dedicated to Venus — a maze and the second-largest collection of classical art in France, after the Louvre. What’s more, England captain Wayne Rooney will be delighted by the hotel’s inclusion of race course on its grounds; England’s highest record goal scorer is an avid collector of racehorses. Located in the historical town of Annecy, and overlooking the expansive Lac d’Annecy, Hotel les Tresoms Lake and Spa is perhaps the most eye-catching hotel of this year’s championships and houses the Icelandic national squad. 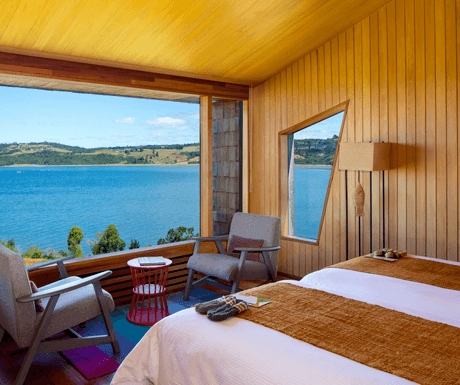 With charming views of the mountains to the back and the pristine shores of the lake to the front, the chic hotel is renowned for its non-identical rooms; each suite is exclusively personalised and come strewn with handcrafted designer rugs. The hotel restaurant’s chic décor is matched by a menu prepared by celebrity French Chef Eric Prowalski and provides picturesque terrace views. Dolce & Gabbana, Gucci, Versace; the Italians fashion credentials have always skewed towards the modern and clean-cut. It seems only right, then, that the national side should choose to stay at Hotel Courtyard by Marriott Montpellier. Designed by famous architect Jean Nouvel, this four-star Marriott property in Montpellier France flaunts a state-of-the-art fitness centre, streamlined outdoor patio with lounge bar and an award-winning Mediterranean restaurant, Oleo Pazzo Mediterranean Bistro. Just 10 minutes from the historical city centre, with its narrow streets and sunny little squares, there is much to see in the southern city of Montpellier, which lies just over four miles from the Mediterranean. Well-known for a siesta and living life in the slow lane, the Spanish have stereotypically opted for perhaps the most relaxing of spa hotels than any other team, the luxurious Hotel Atalante Relais Thalasso and Spa. The attractive four-star complex is located on the sleepy island of Ile de Re, connected to the mainland of France by a bridge to the picturesque town of La Rochelle on the west coast. Nestled next to the Atlantic Ocean, the hotel boasts five-hectares of private vineyards and beaches. The players get full access to an on-site thalassotherapy spa facility, an outdoor sea water pool heated to 32C, underwater jets, a solarium and two restaurants, including Atalante, which serves fine fresh seafood and locally-caught fish. Another of the home nations to make it to Euro 2016, Northern Ireland have opted for the four-star Château de Pizay for their first major finals for 30 years. Located in the heart of Beaujolais country in Burgundy, Château de Pizay is one of the largest estates in the region, built between the 11th and 19th centuries, and is another extravagant French abode to boast a French landscape garden designed by Le Nôtre. The château is surrounded by 80 hectares of vineyard, where guests can enjoy a wine-initiation course, and 30 hectares of forest. Inside, the players will find a superb 1000-metre-squared spa, heated outdoor pool, tennis courts, a courtyard restaurant, billiard room and an art gallery. Helming from the land of myth and intrigue, it is only fitting that Sweden’s national team settled on accommodating the four-star Château des Tourelles. Based on the western French coast and just a stone’s throw from the La Baule, the classic, fairytale-like European castle, with its elegant turrets, looks as though it’s balancing on the cliff-tops of the rocks on the connecting beach below. The hotel boasts two seawater swimming pools heated to 32C, an outdoor freshwater swimming pool in high season, cardio-fitness equipment and a solarium. Only the luck of the Irish could secure you a room at somewhere like Trianon Palace – a regal woodland retreat nestled on the edge of the tranquil Royal Domain in Versailles. The Château de Versailles hotel is steeped in tradition and dates back to 1682, having been built at the request of King Louis XIV. The eight square kilometres of grounds formed the centre of political power in France until the revolution in 1789. On top of significant historical appeal, the château has undergone a tasteful and artful redesign in recent years and features an exclusive Guerlain spa with hammam treatments, meticulously manicured gardens and gourmet dining courtesy of Michelin-starred Gordon Ramsay au Trianon. Jack Huang is CEO of Truly Experiences. I would love to stay in a hotel like Hotel Courtyard by Mariott Montpellier. It feels very natural and refreshing.